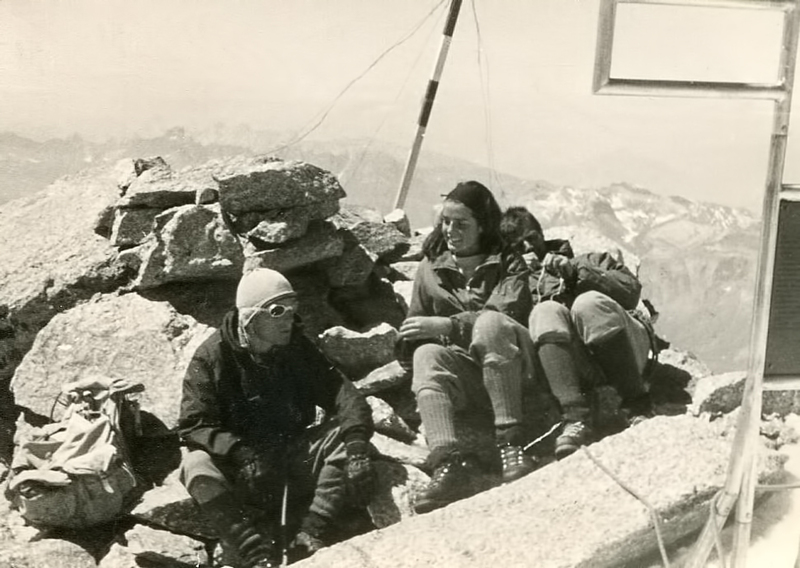 On July 31/August 1, 1962, I teamed up with a very friendly family of French climbers, to do the traverse of Mont Blanc, from west to east. To start, we drove down valley from Chamonix, to catch a chairlift at Les Houches. This chairlift connected to a mountain railway coming up from St. Gervais, to the west. 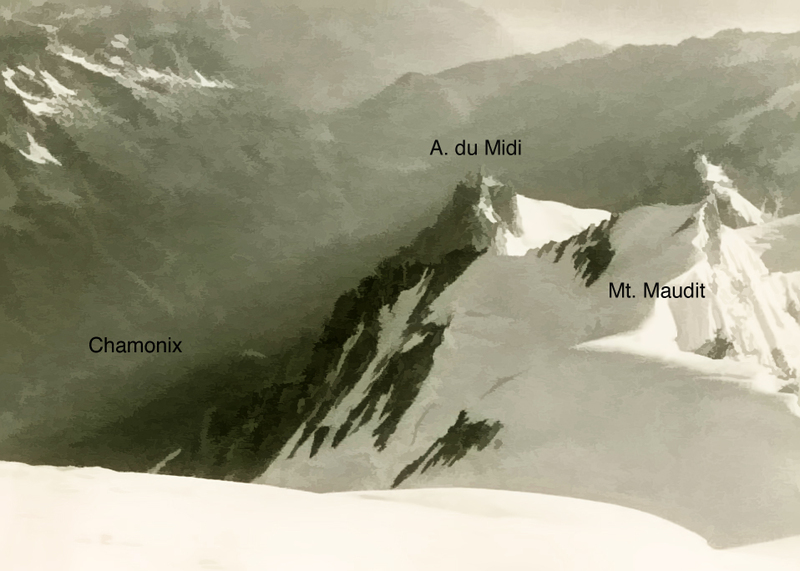 It ascended to the Eagle’s Nest, at 2372 m. From there, we labored up a long, uninspiring slope to the Gouter hut, at 4052m. 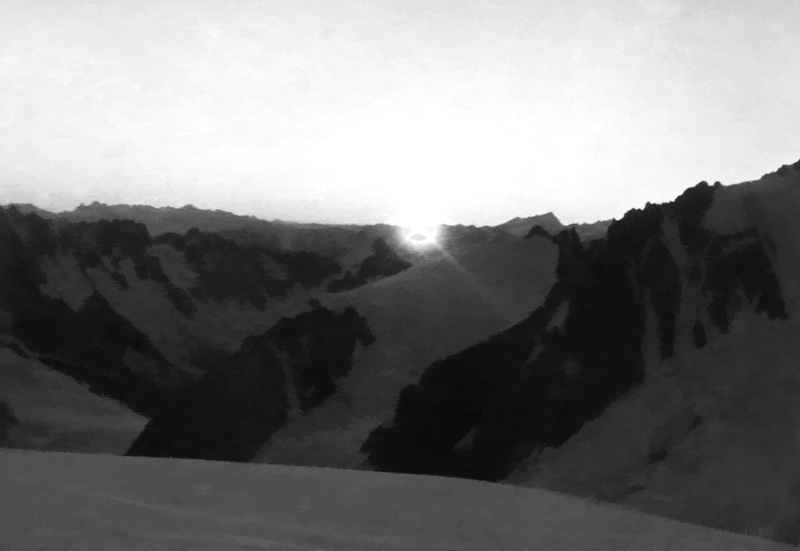 One leaves the Gouter hut very early in the morning for the summit of Mt. 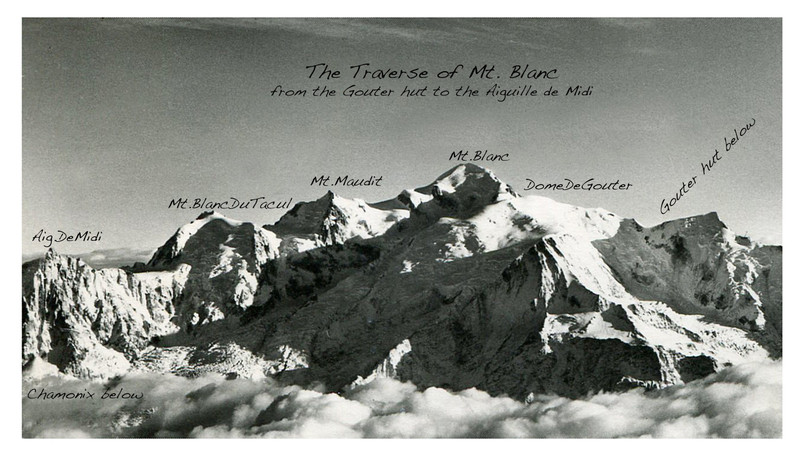 Blanc (4810m), and especially so for the traverse. 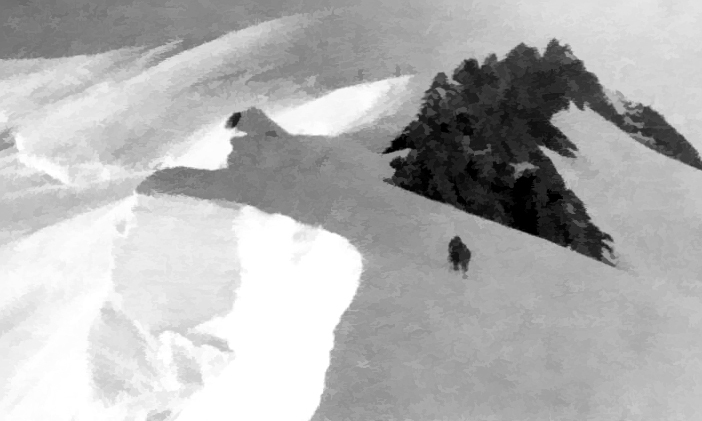 The route is via the Dome de Gouter and the Arete des Bosses, and is a snow trudge and not at all demanding, other than the fact that you are not used to the altitude. 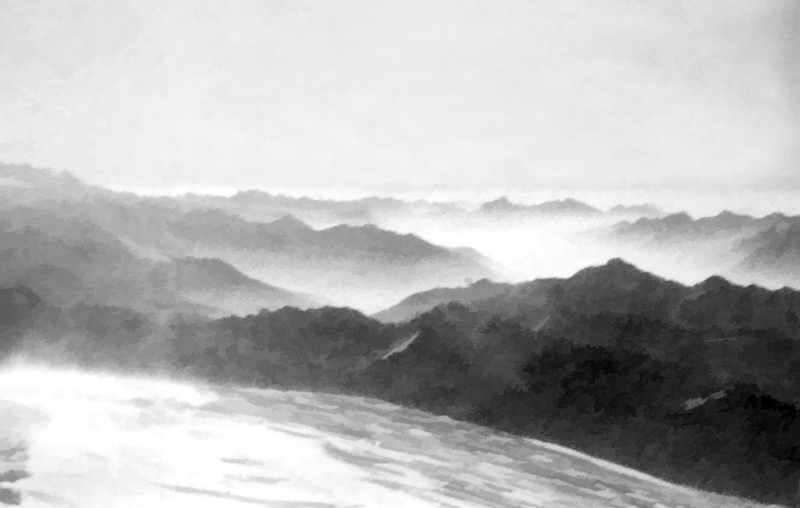 These photos were taken, again, with my subminiature Minox camera. 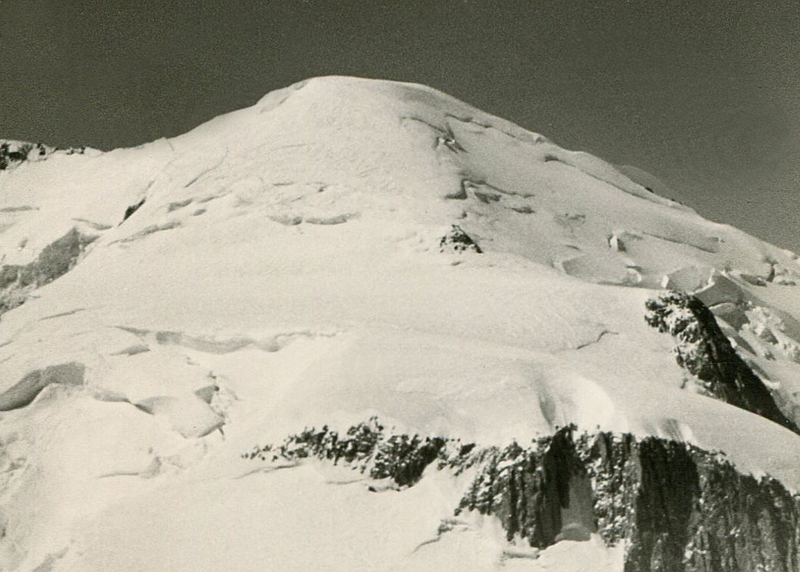 Summit of Mt. 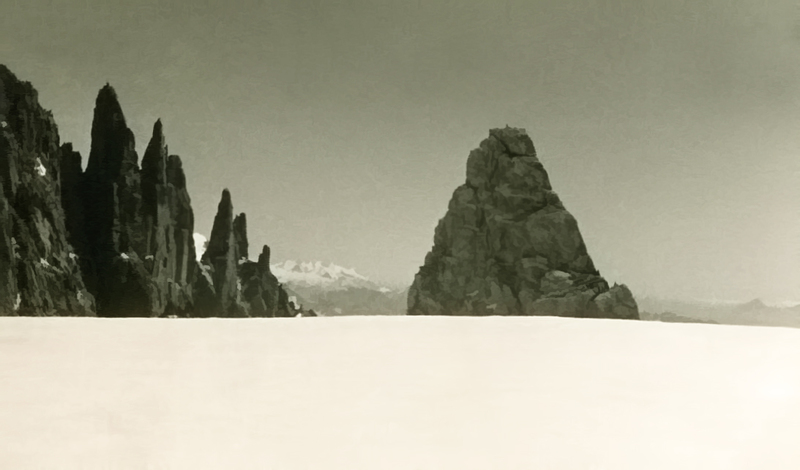 Blanc, looking east. 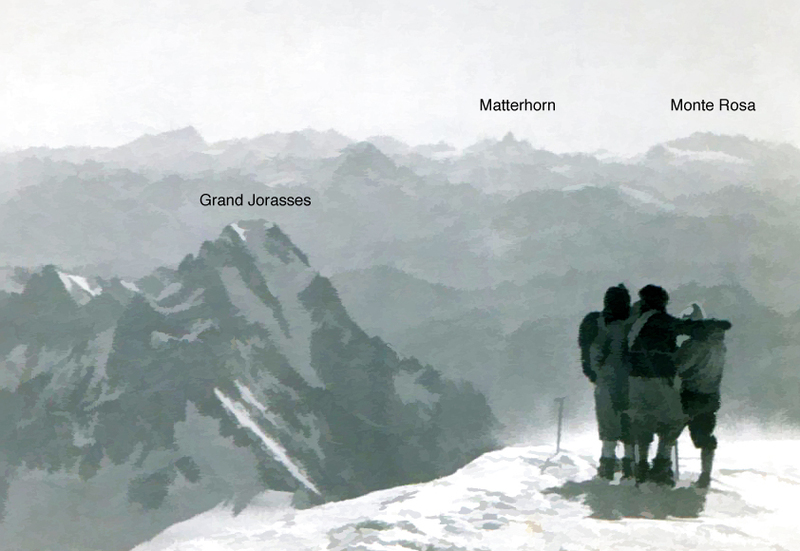 The Matterhorn and Monte Rosa (second highest in the Alps) are in the Swiss Alps. 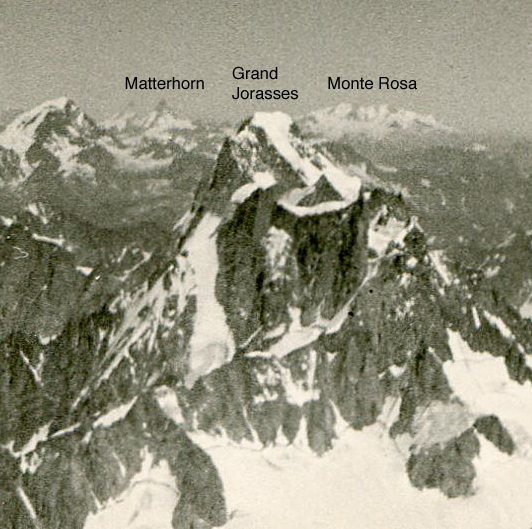 I later climbed both the Matterhorn and Monte Rosa. Looking back to our route off the summit of Mt. Blanc, down a slope called the Mur de la Cote. We are standing on the Col de la Brenva, ready to start our climb of Mt. Maudit. 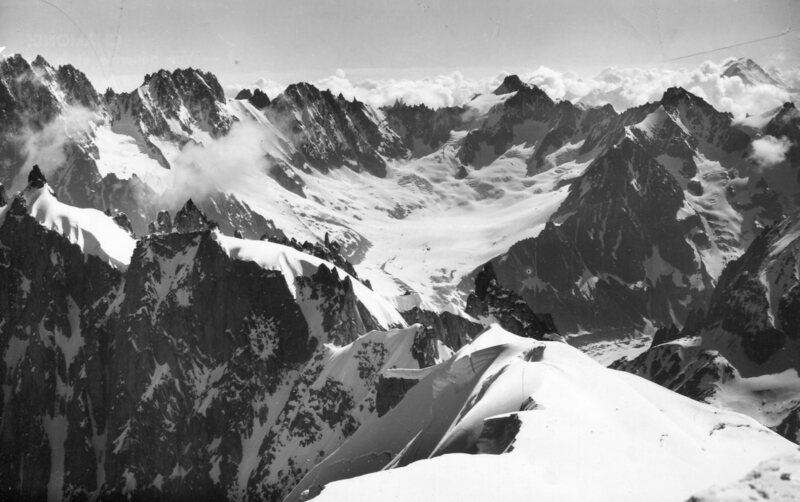 From the summit of Mt. 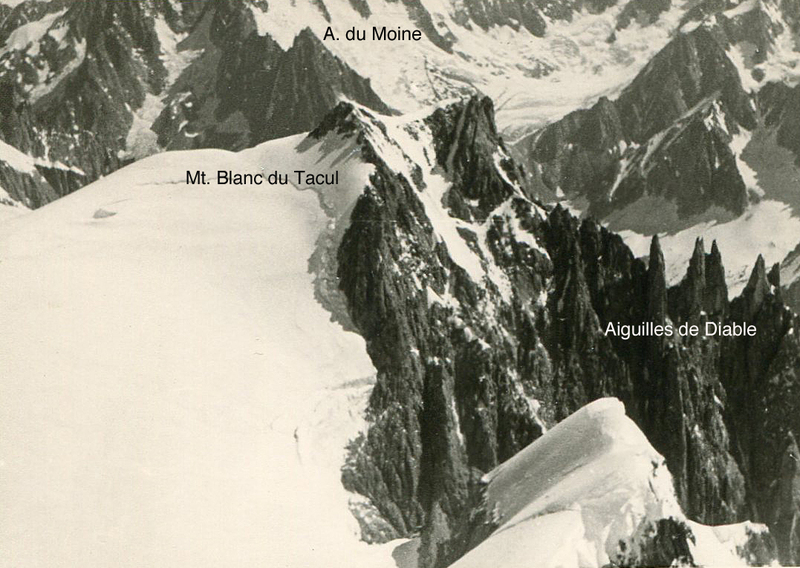 Blanc du Tacul, view to the east. Descending through the “chateaux de glace” (ice castles), a slow-moving icefall, on the north face of Mt. Blanc du Tacul. 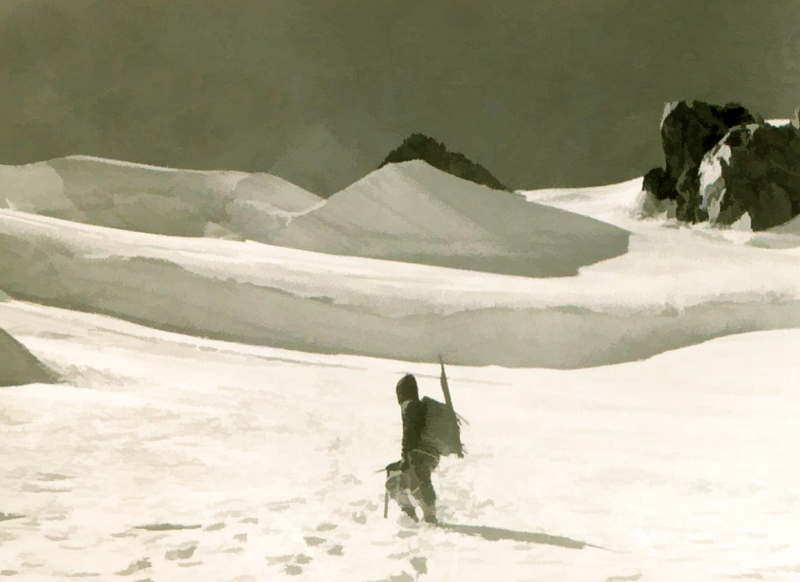 Bernard is carrying a wooden stake, in case we needed to anchor a rappel over a crevasse . 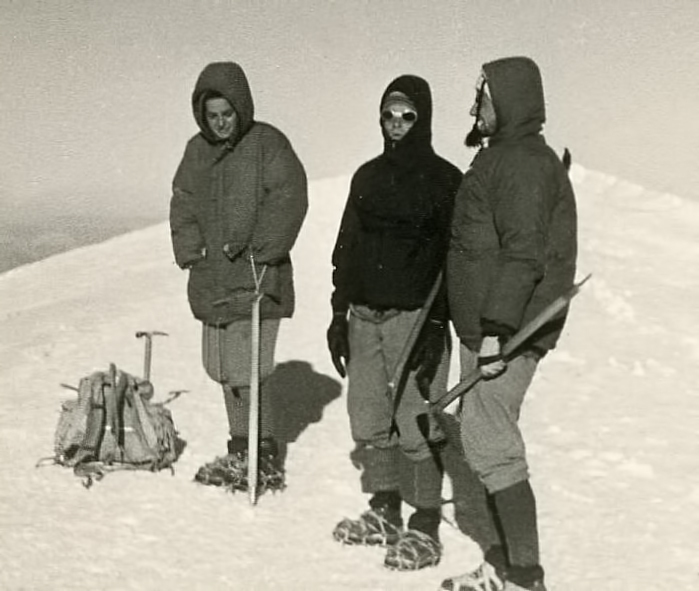 After completing the descent of the north face of Mt. 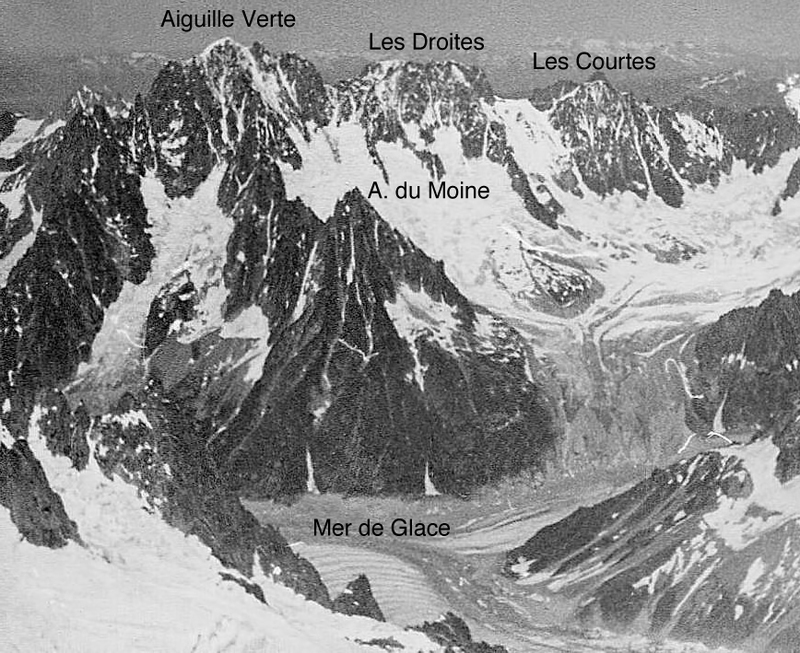 Blanc du Tacul, we slogged across a level glacial plateau to the Aiguille du Midi, with one last climb to the cable car entry tunnel. 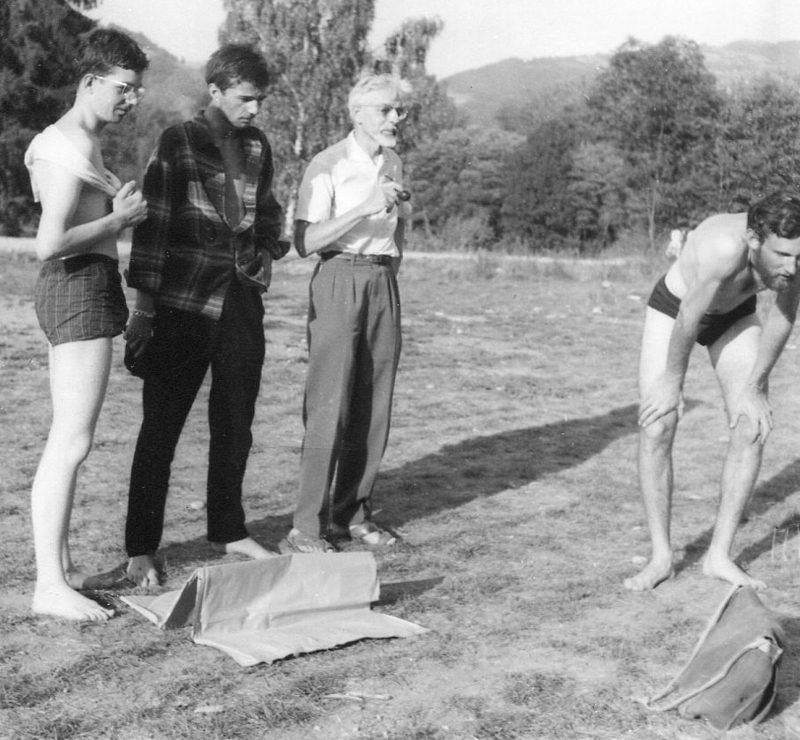 Upon our return, I was invited to visit with the Amy family at their summer place, in the small village of Ayze, located in the Arve Valley, on the way to Geneva. 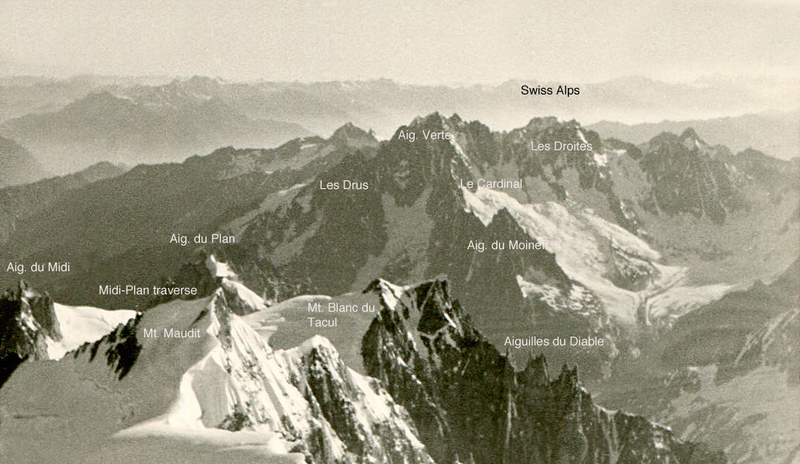 Afterwards, I returned to Chamonix and resumed climbing. 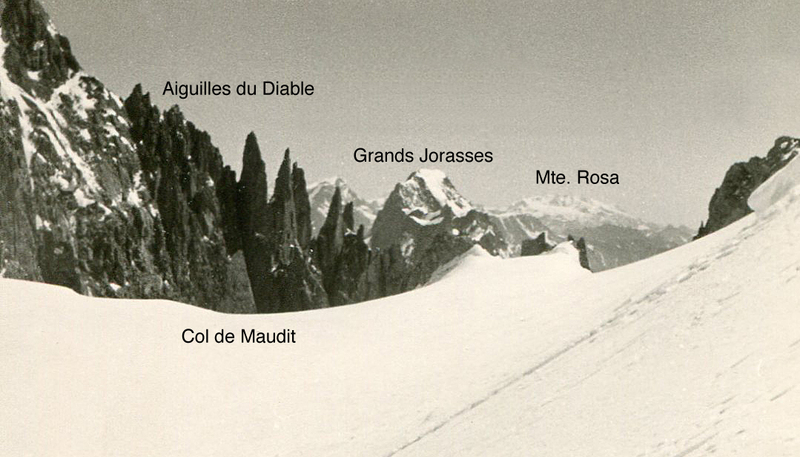 My next climbs included the Midi-Plan traverse, the Dent du Geant and the Aiguille du Moine, by a route which I can’t recall, except for the fact that it was supposedly harder and more “classic” than the “voie normale”. I was with a German climber, and have no photos of the climb. 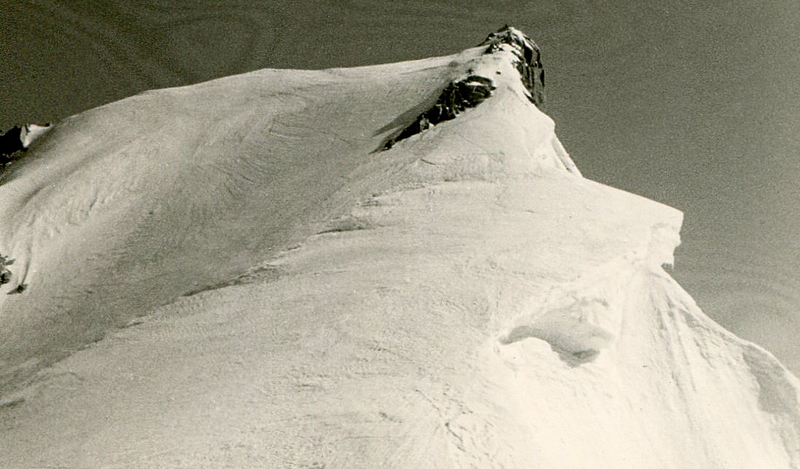 Perhaps it was the East Face? 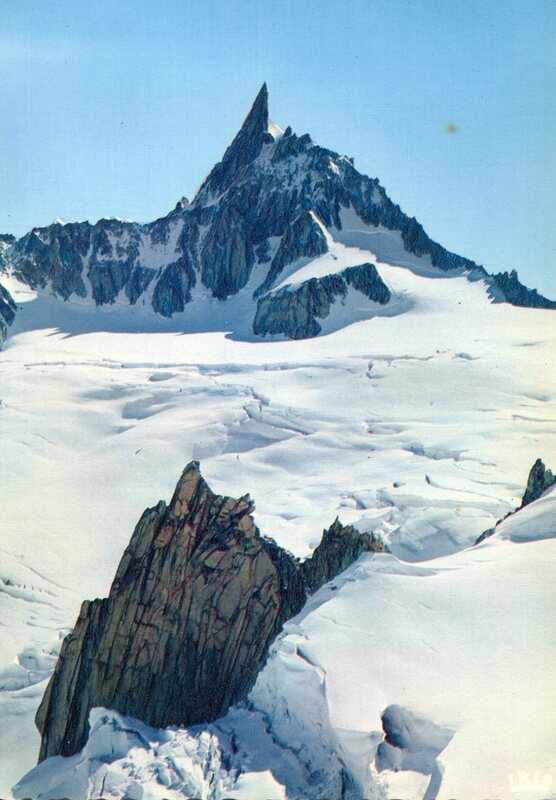 Dent du Geant, 4013m (postcard). 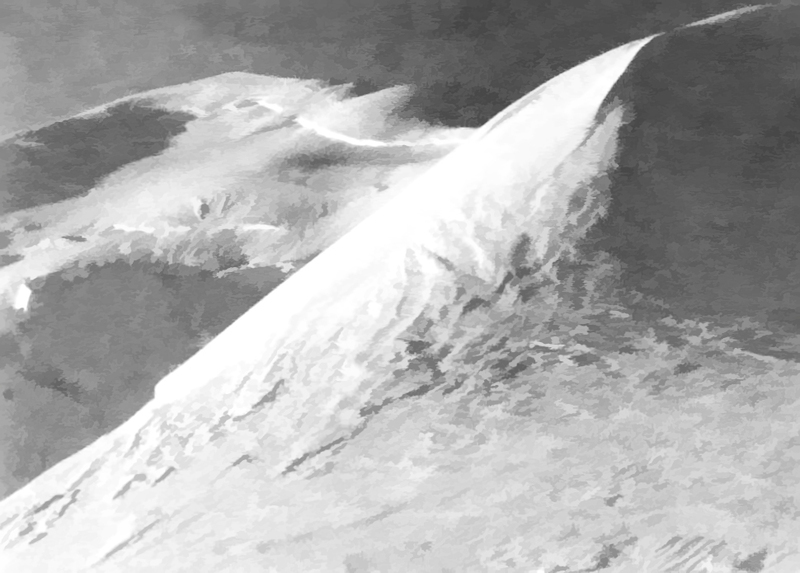 The regular route goes from the snow ramp seen to the right of the peak. 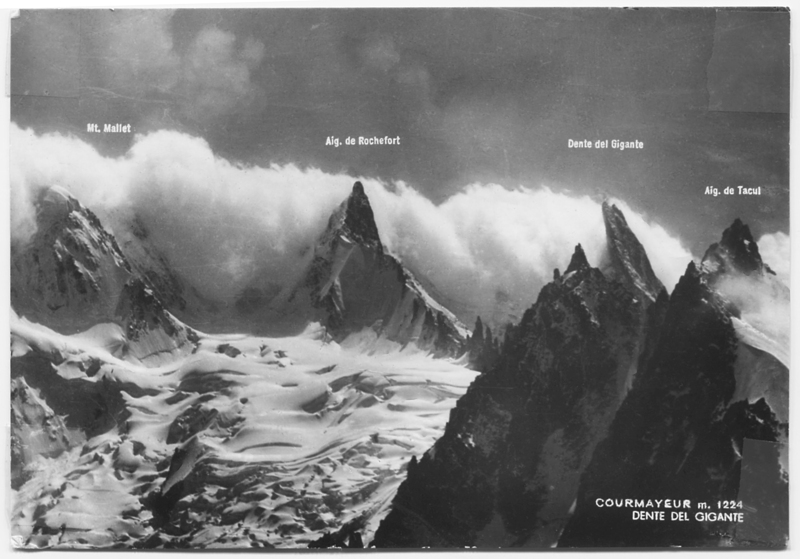 Dent du Geant (postcard Tairraz photo). The regular route goes up the backside of the peak. 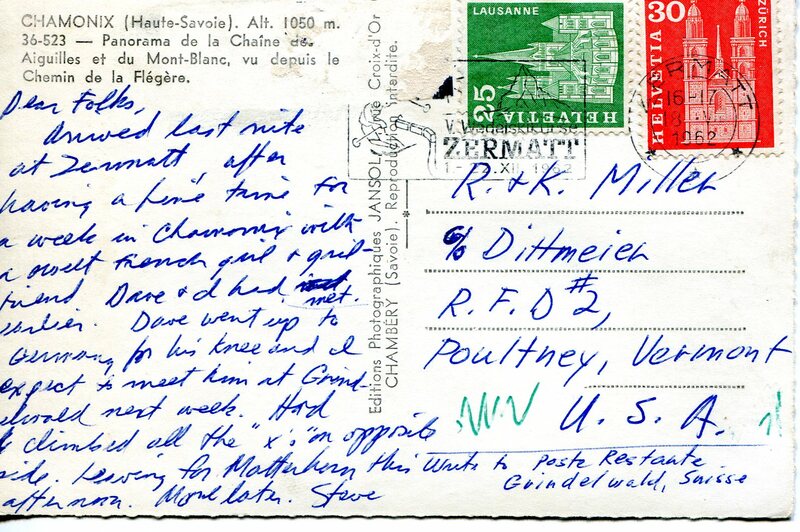 David left Chamonix for Germany on August 10. He caught a ride with an American climber who was in the Air Force, and was returning to duty. This climber told us that he flew a fighter-bomber that carried the A-bomb for Prague. 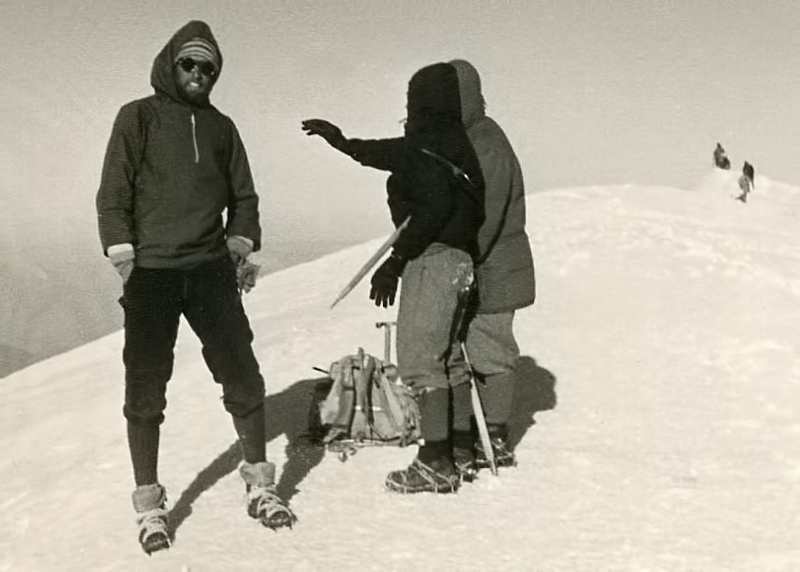 When he flew, he wore his mountain boots, because they gave him only enough fuel for a one-way trip, and he would have to walk home. 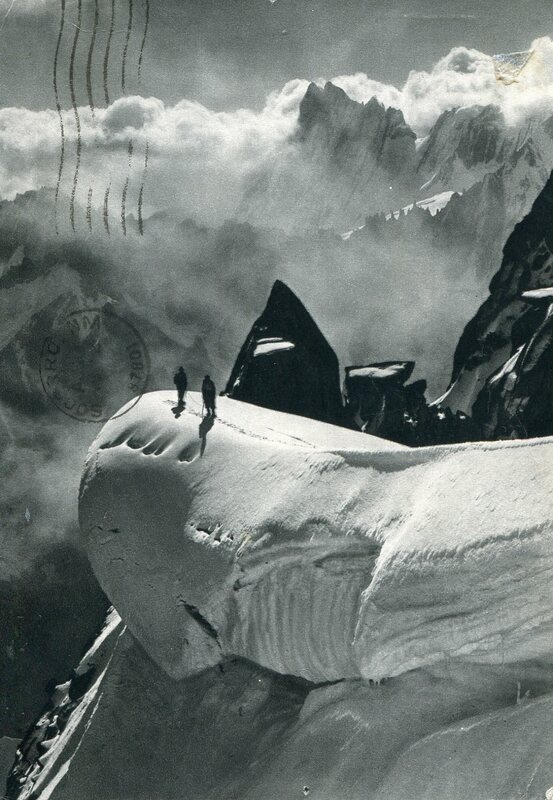 The flyer was John Harlin, and he was making a name for himself in the Alps. 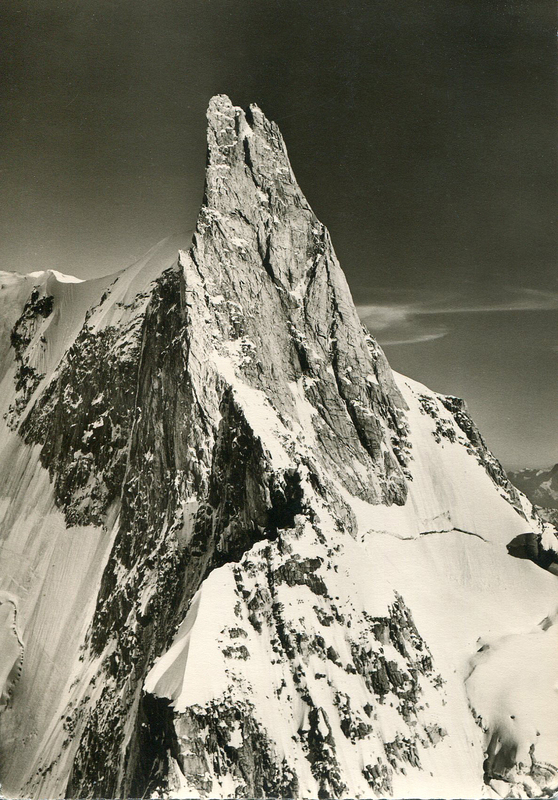 He later died on the Eiger (see postcard below), while attempting a solo winter ascent of the Nord Wand (North Wall), also known as the “Mord Wand” (Murder Wall), using siege tactics. It appears that he fell when a fixed rope broke, probably because it had been hit by a rock. I left for Zermatt, Switzerland around the same time. 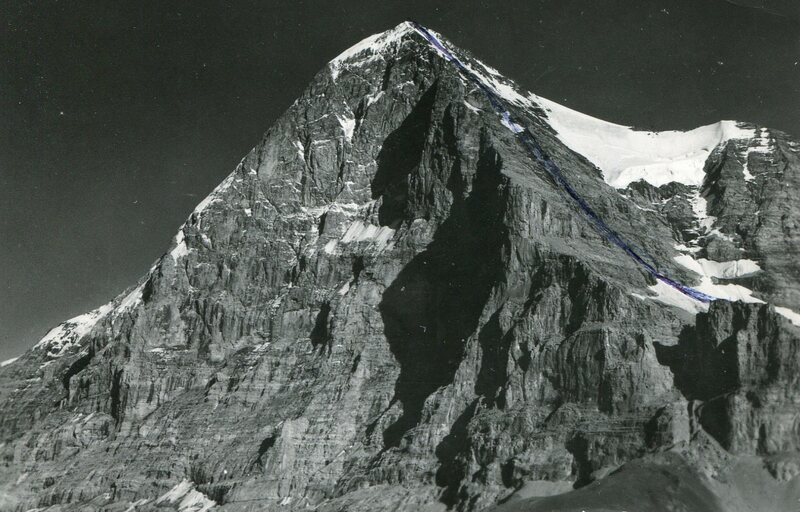 The Eiger, with the North Face. 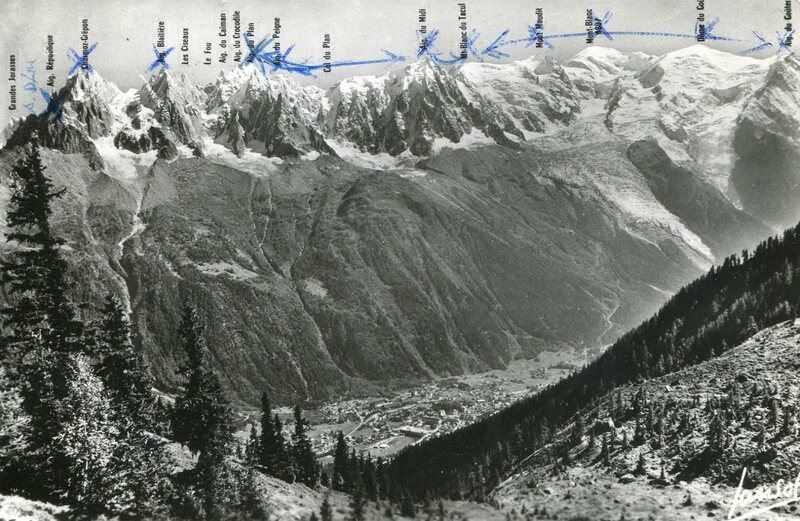 This postcard shows the route I climbed a short time later, the easy West Ridge. 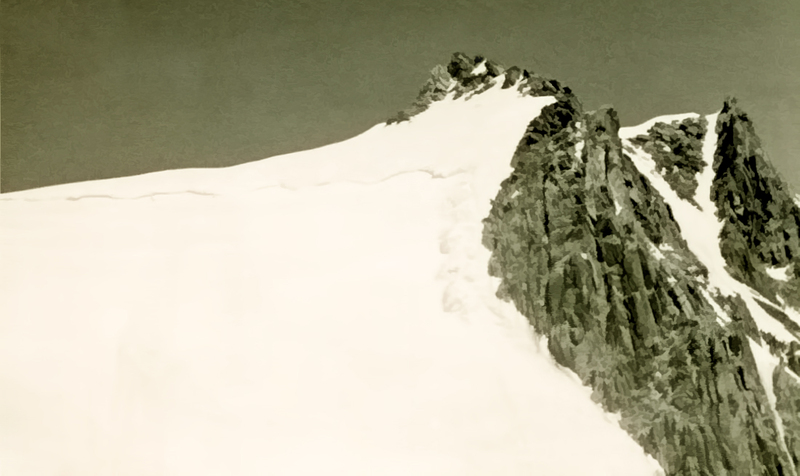 I continued to climb in Switzerland, making my way east as I did so. Those climbs will be seen in the next chapter. 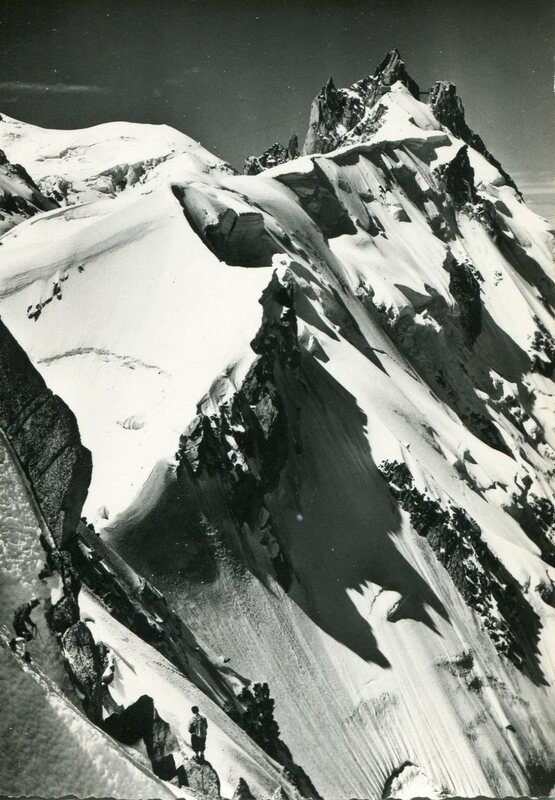 This entry was posted in Mountaineering, Personal history, Photography, Rock climbing and tagged Aiguille du Midi france, Aiguille du moine france, aiguilles de diable france, arete des bosses, arve valley france, ayze france, chamonix france, chateaux de glace, col maudit france, dome du gouter, geneva switzerland, Grands Jorasses, le cardinal france, les houches france, Matterhorn switzerland, minox camera, Monte Rosa switzerland, Mt . Blanc du tacul france, mt. blanc, Mt. Maudit france, mur de la cote france, st. gervais france. Bookmark the permalink. Perhaps you’ve forgotten that I contacted you not long ago. 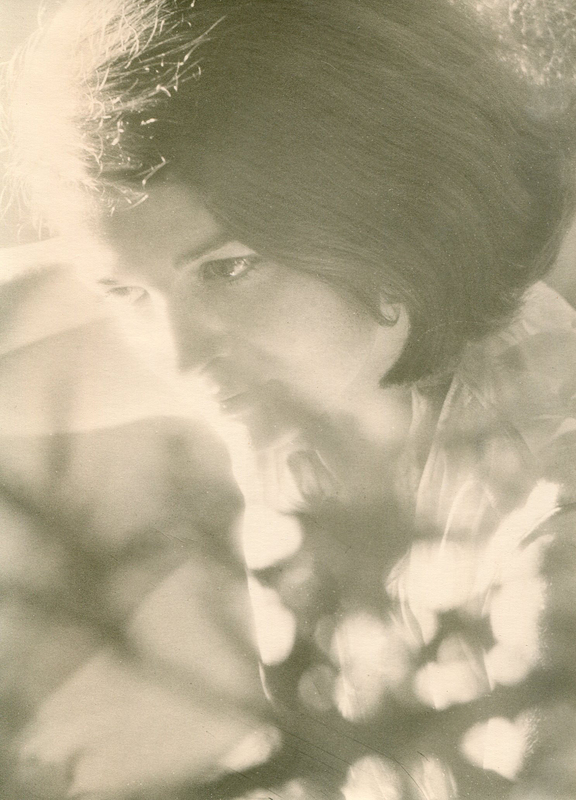 Yes, bien sur, I’m alive – age 78. 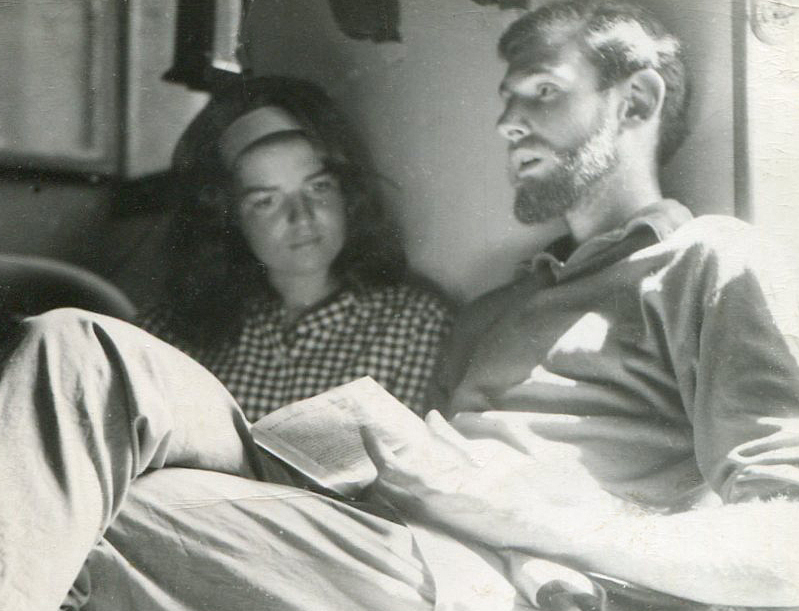 My wife Kathy and I have been operating a rafting company on the Rio Grande in northern New Mexico since 1980 (and continue) . 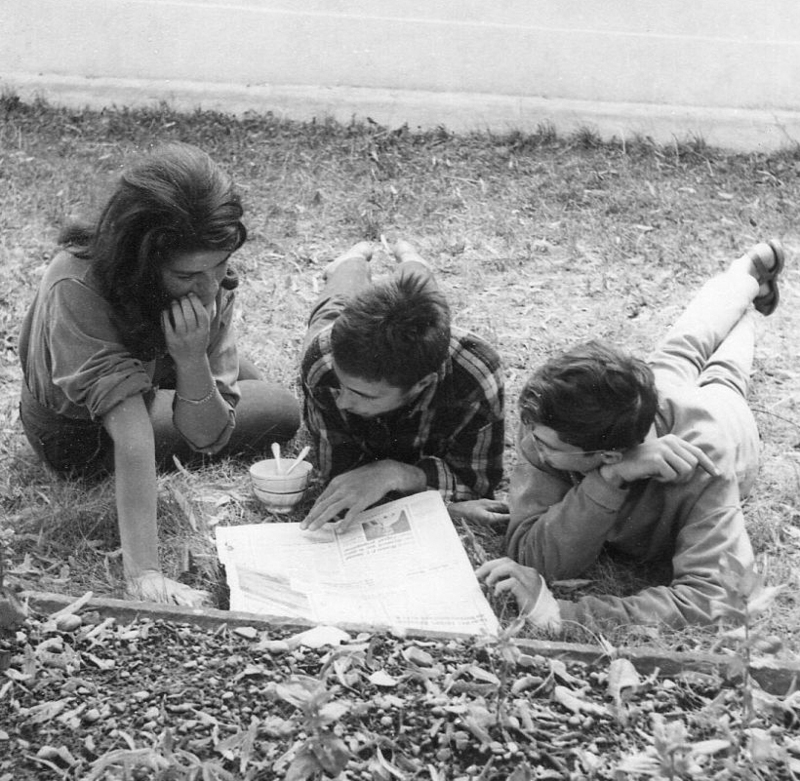 We have three grandchildren by my son, and two by her daughter (we have none together). Big adventures of late: the Rio Maranon in Peru, in 2015, and Ecuador birdwatching last fall. You can read about all that and more on my blog: believesteve.org. Be sure to send my regards to Eglantine, of course. Be well!